Willa, protector of hops, all grown up! 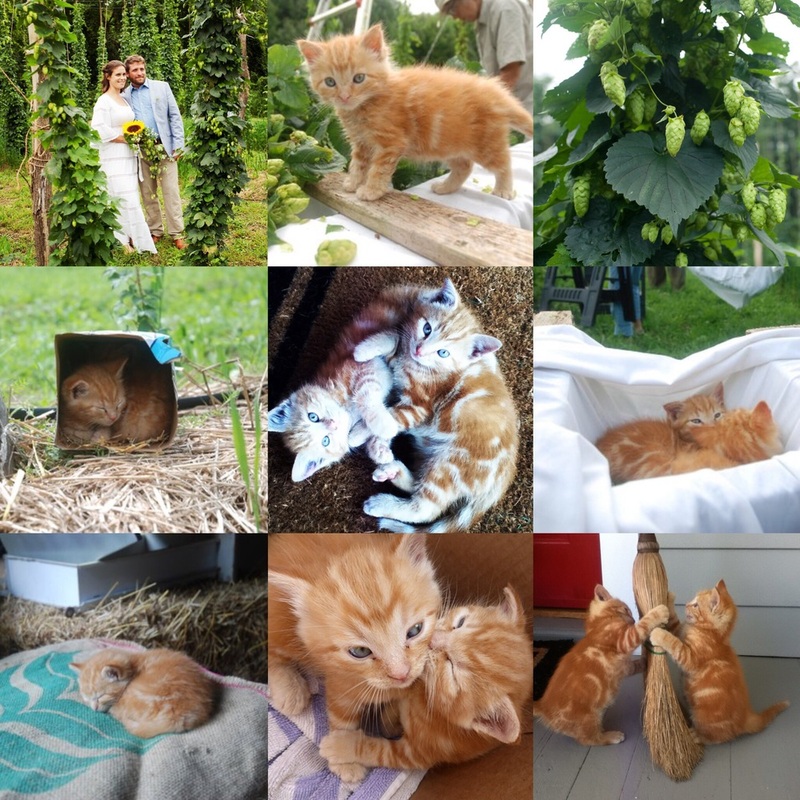 Two orange kittens appeared on our farm the morning of August 16th, 2014. It happened to be our wedding day. Saul and our friend Guillaume discovered the little critters next to the hop yard in some straw bales they were setting up as seating for the day's celebration. I'll never forget Saul walking into our kitchen with two little balls of orange fluff in his hands. My wedding day stress evaporated. It was love at first sight and they've been our beloved farm kittens ever since. One boy kitten. One girl kitten. Albert and Willa. Last August, we went from wedding to harvest over a handful of days. Our kittens were in the thick of it. Long hours of hand-picking row by row. Long hours of drying hops in the barn. Hop harvest is a round the clock operation, much like my current days of caring for newborn Toby. Albert and Willa, our first farm animals, have literally grown up in the hop yard. They learned to run in the hop alleys. They learned to climb up the locust posts. They learned to hunt vermin under the mulch. As Griffin Hill grows, animals will play an important role in our sustainable farm brewery system. Symbiotic relationships are a cornerstone of our vision. Why throw away spent grain from brewing when it is valuable animal feed? Why buy compost for the hops when we can make our own? Why bring in expensive equipment to clear land when pigs are up to the task? Why spend hours weeding and mowing when sheep can do the job for us? This last question looms large in our minds these hand-labor-intensive days! Hop growers in New Zealand, one of our favorite hop growing countries, commonly run sheep in their hops yards in both organic and conventional production. Many hop growers in the Northeast are experimenting with this practice as well. I've attended some great workshops on sheep husbandry and utilizing sheep in the hop yard at various conferences over the past couple years. I'm just waiting for the right time to become a shepherd. Launching beer sales will come first (more on that soon), not to mention adjusting to life as a new mother! So for now, in terms of our animal friends, it's just Albert and Willa, our trusty cats! Every brewery needs a cat, or a few, to protect the grain stock from rodents. Our cats are on on double duty, managing rodents in both the hopyard and the brewery. 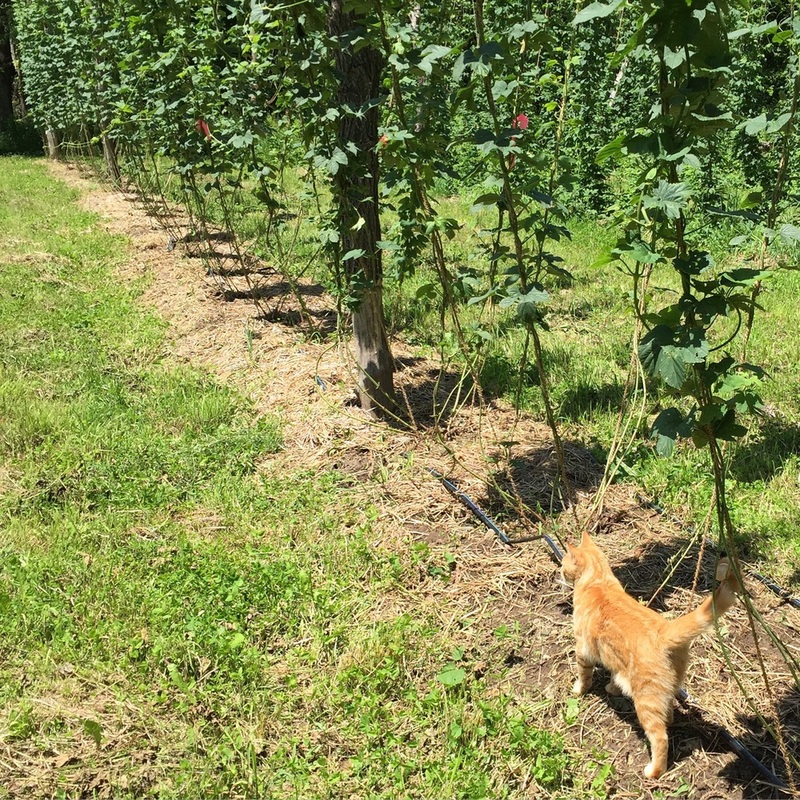 If the kittens were our muses for Hop Harvest 2014, and Toby will be our muse for Harvest 2015, perhaps some lambs will be our muses for Harvest 2016!